VICOM has announced the new FLS-2300B amplified spontaneous emission (ASE) broadband source from EXFO Electro-Optical Engineering. EXFO's second-generation broadband source displays an excellent 0.01dB spectral power stability. This stability makes the FLS-2300B ASE Broadband Source ideal for characterisation of DWDM passive components, such as thin-film filters, arrayed waveguides, and fibre Bragg gratings, and even for network characterisation. The new broadband source also covers an extended spectral wavelength range, including the C and L-Bands. Recent advances in optical-amplifier technology have opened up the L-Band for commercial transmission equipment, effectively doubling the potential capacity of DWDM systems. However, associated with this extended wavelength range has come the need for the same rigorous testing of L-Band components as that already in place for C-Band components. 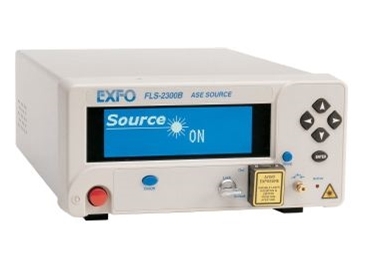 The FLS-2300B is particularly well adapted for testing in both bands. Combined with EXFO's manufacturing-plant (IQ-5250) or field-ready (FTB-5240) optical spectrum analyser, it achieves a fast testing time and a high dynamic range over the larger spectral window now used in advanced optical networking. Vicom Australia 03 9563 7844.